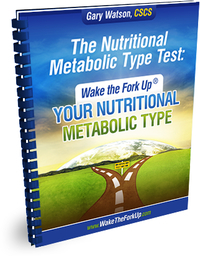 ﻿﻿ Eat Right For Your Nutritional Metabolic Type | Wake the Fork Up®! Have you ever asked yourself why your friend can eat certain foods and look and feel great, when these same foods make you look and feel terrible? In other words, why is “One man’s food, another man’s poison?” We see it everyday in our “one size fits all” diet routines.